Cheap flights to Portugal: Lisbon from Berlin for €69! Easyjet now offers cheap prices on flights to Portugal in beginning of 2015. 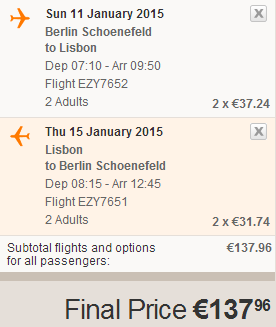 You can fly from Berlin to Lisbon for only €69 if you travel in couple. These prices are valid for travels in January. Price includes only cabin luggage but its not limited by weight so it should be enough for such a short stay.